This year, 2013 we are seeing 50th Anniversary celebrations for Automobili Lamborghini SpA all over the world, and a special edition of the current flagship, the Aventador has been released to celebrate this once in a lifetime event, the LP720-4 50° Anniversario, available in close coupé and roadster version the entire production run of 100 units each is already sold out. At the 2013 Geneva Auto Show in March we also saw another, very special car being unveiled as a 50th Anniversary special too, the Veneno LP750-4 perhaps looks like a full blood race car, but it is completely street legal ... but there still is a downside: only three are built and it has a sticker price of a cool 3,000,000 Euro ... and it is sold out too unfortunately. Rumor has is Lamborghini is thinking about building a few more Veneno ... but in Roadster form this time, and priced even higher ... but think about this ... the next anniversary worth celebrating would be in ten years only, and that is exactly what Thomas Granjard had in mind when he had to put together a project for his final year of the Automotive Design course at the Coventry University ... he designed the 2023 Lamborghini Diamante concept. Thomas took inspiration from some of the most famous models ever to leave the factory gates at Sant'Agata and combined it with the most valuable mineral out there ... a diamond, once cut the latter shows many facets, just like the angular style of this Lamborghini concept, which runs on four electric engines by the way ... as by the time we reach 2023 there might not be enough oil left to produce fuel for cars like this ... which will remain a dream for most people just like today's Raging Bulls. Still Granjard added two Micro Jet turbines that can run on anything like diesel or bio-fuels ... even compressed natural gas or liquid petroleum gas, these turbines create energy to run a generator that charges the batteries to generate an action radius of 900km in total or 150Km using only electricity. As mentioned the Lamborghini Diamante concept would be using four electric motors (weighing in at 45 kgs each) that deliver a power output comparable to 800 hp with 1600Nm of torque available, that is some serious pulling power ... add a 120kW (165hp) Kers system this totals to 965 hp, more than enough to really enjoy this amazing looking car. Inside the modern styling continues with a very innovative control panel on the central console consisting of three wires with adjustable 'sliders' to control the Diamante, like the adjustable wings at the front and rear of this concept ... a fully automatic system will set the angle of these wings just right, but manual overide is most likely also available. Naturally the smooth exterior of the Lamborghini Diamante Concept doesn't get ugly rear view mirrors anymore, instead we notice tiny cameras on the wheel arches transmitting their 'view' inside on the multitude of LCD screens ... note that the top section of the squared off steering wheel consists of an LCD display too. And Thomas Granjard has actually thought of everything ... there is a closed version Diamante with a glass canopy style roof section ... but additionally he also designed a real Roadster edition ... or should that be Barchetta as the windshield is a lot lower compared to the coupé edition ... in fact on the Diamante Roadster we notice a dual windshield setup like the Aventador J used back in 2012. 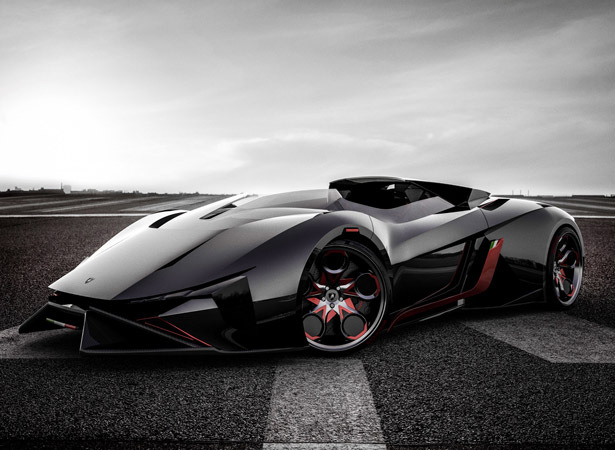 The styling on this Lamborghini Diamante Concept is very angular and futuristic, but still there are many parts that we recognize ... like the clear carbon fiber front spoiler, the TriColore shades up front and on the 'swooping' side sills while just behind the side windows we notice black parts that remind us of the air intakes on the current Aventador ... and the overall impression shows many triangular lines like the Nuova Gallardo LP560-4. Naturally this Diamante Concept vehicle has been designed by Thomas Granjard without connection with or in any way being authorized by Automobili Lamborghini S.p.A. ... it is just a creation of a talented designer ... in fact there has been a model created that has been shown at the degree show back in May 2013 at Coventry University.